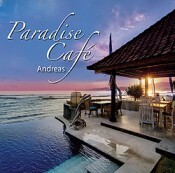 Yes, I have occasionally been caught with my toes tapping to the New Age/light jazz/world-pop tones of Andreas’ Paradise Café. It’s hard not to. While the music here runs quite a bit lighter than my usual tastes, the allure of its upbeat chillout, laced with hooks and global flavors, can be hard to deny. The title track sets a Calypso tone straight out of the box, a quick dose of musical mood elevator to get you started. “Evolving the Distance” pairs acoustic guitar with a textbook backbeat and Middle Eastern vocals (which are featured on several tracks). “Night Vision” gives us the tang of mixed strings–Spanish guitar and what sounds like an oud or sitar. “Simple Pleasures” is just that–an into-your-soul jazz groove complete with a brushed backbeat, drops, and a megadose of feel-good. Andreas laces some of the background with the sound of waves, amping up the disc’s theme of taking some well-deserved downtime somewhere tropical. Mostly what’s here is a decently crafted, cool take on smooth jazz aimed, according to Andreas’ label, at the spa crowd, and thus suitably light in tone and approach. Listeners looking for a lot of substance are advised to head elsewhere. It’s mood music, and the mood is a bit fluffy. In with the bearable lightness of this disc’s being, there are spots where things get a little too sugary for me, as on “Secrets of the Deep.” However, I can’t deny that listening to Paradise Café has managed to enhance my mood here and there. Plus, I now want a daiquiri and some coconut shrimp.